Come along on our visit to the Boston Whaler factory in March of 2005. We're driving north about 65-MPH in a rental car on U.S. Highway 1 in Florida on a cold and rainy winter afternoon in March, heading for 100 Whaler Way, the address of the headquarters and factory of the Boston Whaler Company in Edgewater. We've never been there, and we're relying on directions from MapQuest to guide us. The water and shore must not be far to the east, as we've just passed several boat dealerships along the roadside, ironically selling Carolina Skiffs and Yamaha motors. Around the next gentle bend in the road we fly past the entrance to our destination. "There it is," I tell Chris, my wife and boating partner. I make a quick U-turn and head back. This is exciting. We're about to visit the Boston Whaler owner's equivalent of Mecca. 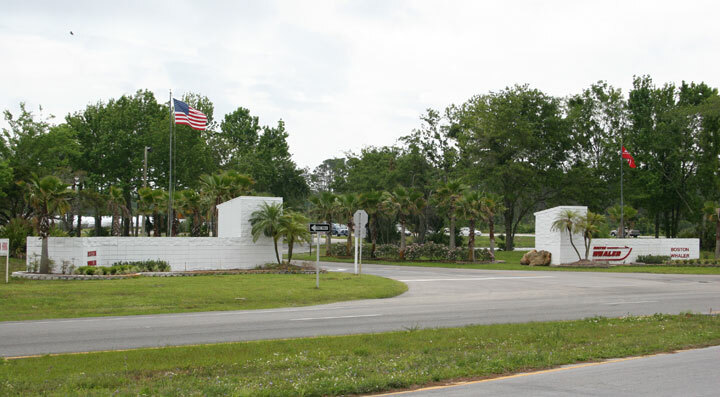 A few miles south of Edgewater, Florida on U.S. Highway 1 is the entrance to the Boston Whaler plant. The giant red Boston Whaler logo stands out against ten foot high white brick walls that flank the entrance road. A large sign announcing "Now Hiring" is also prominent. We drive through the impressive gateway and immediately come upon a small pond. Moored in the center are two halves of a 110 SPORT Whaler, recreating the 1959 advertisement that introduced the brand, perhaps the most famous boating promotion of all time. (This boat has actually survived all three recent hurricanes anchored in the pond, we learn later.) The road curves around several parking lots, filled with hundreds of cars. "This place is huge," we both say. It is much larger than we expected. It is pouring rain, and we make a mad dash for the door. Shaking the rain off like a wet dog, we approach the receptionist and sign the guest register. "You must be Mr. Hebert," Peggy says clairvoyantly as she hands us visitor badges. "Mr. Bennett and Mr. Berman are expecting you." A moment later we are greeted by the familiar face of Ron Berman, head of Boston Whaler engineering whom we met at the Miami Boat Show in 2004. He's kindly offered to conduct this tour himself. And a moment later we're pleased to finally meet Chuck Bennett in person, after becoming acquainted through dozens of telephone calls and emails over the years. Chuck is thinner and younger than I imagined him, and he has a beard. He's a transplanted New Englander, too, having worked for Boston Whaler at the Rockland, Massachusetts plant but moved to Florida in 1988. Chuck hands out safety glasses, and the tour begins. The plant is logically arranged with the end of production line nearest the roadway, so our first step is to walk to the back of the building to see the whole assembly process in sequence. I am still reeling from the overall size of this place. There are 430 hourly employees and 280,000 square-feet under the roofs of several buildings, Chuck tells us. This facility was originally built by another boat builder, but acquired by Boston Whaler in 1987 to expand their manufacturing capacity. Ultimately, the entire Boston Whaler operation was consolidated here in 1994 by then owner Meridian. "What was the name of the boat builder who originally built this plant," I ask. "That was FLORIDA WATERCRAFT," answers Ron. "Some of their employees stayed on and are still with us making Boston Whalers. We have expanded the plant quite a bit since then." Ron explains we're going to break from the regular tour path, and he'll show us some of the behind-the-scenes facilities at the plant. This will give us a better understanding of how Boston Whaler builds boats. Our first destination will be the Engineering Department on the second floor. Boston Whaler boats today are first seen on computer displays through numerically modelled images of the design. The hull's shape and structure are described mathematically, which allows them to be both visualized and tested before they are actually built. A number of different professionals are involved in the process. 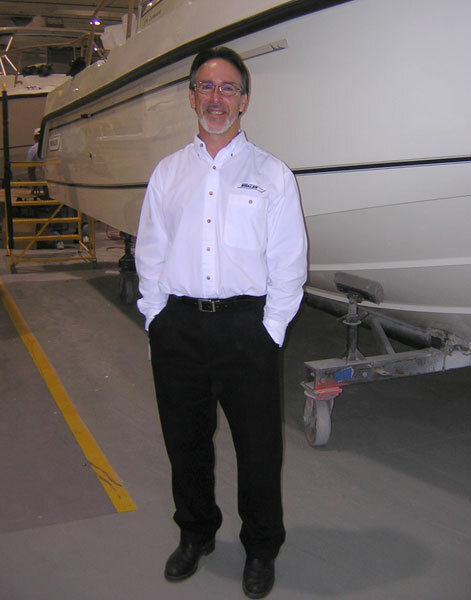 Naval Architect—Senior Design Engineer Keith Ranieri is Boston Whaler's on-staff Naval Architect. Keith is a graduate of the University of Michigan's College of Engineering with a degree in Naval Architecture, plus a Masters degree from UC-Berkeley. A large Maize and Blue block-M flag hangs in his office, inspiring new hull shapes. Structural Engineer—To analyze the strength and structure of their boats, Whaler recently added a Ph.D. Mechanical Engineer. Using finite element analysis techniques, the required strength of the materials in the boat can be predicted. This sophistication allows the boat and its component parts to be made as strong as required, but without adding weight (and cost) from unnecessary over building. By careful analysis, areas of high stress can be predicted, and proper construction techniques applied. Because of this, your new Boston Whaler boat won't have stress cracks in the gelcoat appearing after a year or two of use. Whaler will have already seen those stresses and designed the laminate to provide for them. This new technology was only recently added to the Boston Whaler design toolbox. Propulsion Systems Engineer—Selecting the proper engine and propeller is the job of the Propulsion Systems Engineer. Each boat model is carefully evaluated for engine weight, horsepower, cost, fuel economy, propeller, and performance. "Today's advanced engine and control systems require thorough attention to detail to optimize each application," Ron tells me. Compliance Specialist—Building boats commercially requires compliance with many standards and regulations, and to ensure Boston Whaler boats meet all of these is the responsibility of a Compliance Specialist. Standards from the National Marine Manufacturers Association (NMMA), National Marine Electronics Association (NMEA), American Boat and Yacht Council (ABYC), and, of course, the United States Coast Guard (USCG) all have to be met. In addition, Boston Whaler boats are sold overseas, so standards applicable in foreign countries also have to be considered. Program Manager—Tracking each product throughout its life cycle is the job of the Program Manager. He (or she) collects research and feedback from dealers and customers, and helps to decide what boats and what features to build. Ron also tells me, "We have recently filled a new position—Advanced User Research Specialist—to focus on collecting the 'Voice of the Customer.'" When a new model has been developed and prepared for production, sometimes the digital design information is used to create an actual small-scale model. This allows the boat's lines and dimension to be physically seen and evaluated. A number of these quarter-scale or smaller models were hanging on the walls of the factory in the prototype area, our next stop on the tour. It was our good fortune that on the particular day we visited there weren't any prototypes in the mold shop that hadn't already been shown to the public. Thus we got a chance to see this part of the factory that is usually on very limited access. When a design is ready for production, the next step is to have a full-size plug made for creating the tooling. These plugs are made on a five-axis computer controlled mill and are cut with extreme precision and symmetry. "SeaRay owns the numerically controlled mill (NC Mill)," said Ron, "but, contrary to some people's opinion that I've read on your website, the designs are all from Boston Whaler." To create a boat generally requires three major assemblies: a hull, a liner, and a superstructure. To actually create these complex shapes from the digital plans uploaded into the NC mill, large blocks of foam are glued together to provide a material base to be shaped by the computer controlled cutting tool. A first pass of the mill turns the foam blocks into a full size boat part. Then, the foam is coated with a special putty surface, and the part is cut again. This produces a very fine and accurate part shape. At this point, the full-size shape of the new master part will first be seen by its designers. If they like what they see, the sculpted foam will be transformed into a master plug. If not, it is back to the computer screen for some revisions. "A change at this step is a very rare occurrence," says Ron, "as the mock-up's and design reviews prevent these down stream changes." The raw plug is transported to the Whaler factory, where additional hand sanding and primer work is done. Then it is ready to create the production tooling for building the boat. The first step is to construct a mold from the plug. 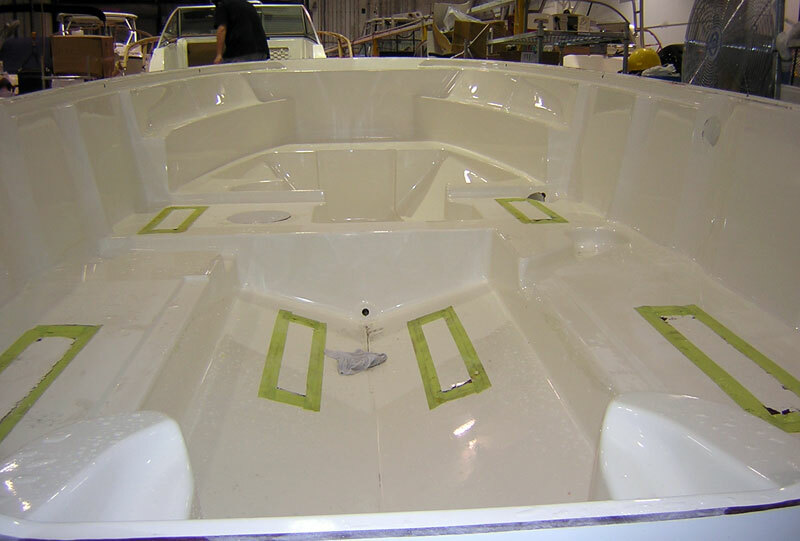 Building a mold for a Boston Whaler boat is about three times more expensive than for most other boats of similar size because of the high strength needed in the mold to resist the pressure of the expanding foam of the Unibond™ hull construction. From the plug, a mold is made by first carefully preparing, cleaning, and polishing the plug, and spraying it with a release agent. Then a female mold is laminated from the plug, built up in layers of gelcoat, skin coats, resins and laminates. When making up a hull mold, Whaler uses bright green or orange gelcoat colors. (The reason for this will be explained later.) Before the mold is parted from the plug, it is laminated onto a steel framework. The mold is carefully popped off the plug and inverted, then closely inspected for any flaws--everything must be perfect. Now the mold can be rolled around the plant and used for actual production. As we passed through the prototype area we saw the production mold for the new Outrage 320 Cuddy deck cap. The tooling for making a 32-foot boat is quite impressive. These molds have to cost a small fortune. The prototype shop also makes all of the steel tooling and fixtures for the molds in their complete metal shop, filled with lathes, welders, and other metal working equipment. The next step in the new boat design process is to lay up a prototype hull in the new molds. There was a new prototype hull being laid up, so we didn't get to see this area. East of the main plant in a separate building is another prototype area. There a small number of craftsmen boat builders finish off and outfit the prototype hull into a complete boat. Engines, fuel tanks, controls, wiring, hardware, etc., are installed, and now, for the first time, the new model of Whaler is ready to be put in the water. If all the computer modeling and design has been accurately performed, the engineers will be rewarded with a boat that floats exactly on her intended waterline and performs as well as predicted. We stopped in for a look and found the 235 CONQUEST prototype, just back from an appearance at the Miami Boat Show where it was shown to the public for the first time. We hopped aboard for a closer look. I'd seen this boat in artist's renderings, where it looked terrific; the actual boat was just as impressive. I really like the sheer line on this boat, which is much straighter than other CONQUEST models and more reminiscent of the classic era Whaler hulls. "I love these hawse pipes," I told Ron. "They're part of what makes a Boston Whaler distinct. What other small boat has hawse pipes?" Ron showed me some other new features, including a new hinge design for the fold out seat. "We have a patent application pending on this," he said with pride. I commented about the sophisticated construction of the hardtop support frame. "Every segment of this tubing has a curve to it," I noted. I was admiring the graceful curves of the hard top support frame, when Ron explained another detail about it. "Using finite-element analysis, we found that the original design for this frame was too rigid. It was stronger than the hull, so at the attachment points on the gunwale there was a great deal of stress trying to resist some hull flexing. We made the tubing section smaller, and this actually reduced the stress at the attachment point." Good engineering like this—in advance—eliminates gelcoat and laminate cracks showing up after rugged use of the boat. I have to think you don't get this kind of engineering built into every boat brand. We also saw a new detail in the bow: the bulkhead which separates the anchor locker from the cabin is now molded into the hull liner, completely separating the two areas. In older designs (like my 1992 REVENGE 22 WT WD), the bulkhead was added after molding, and a separate piece was caulked in place to create the seal. We also saw a prototype of a 170 MONTAUK variation being built for use at a Disney theme park. The boat is designed for rentals to park visitors for slow cruises around the canals. It had a large bimini top, extra seats, and stout rub rails. A Mercury four-stroke 9-HP motor was on the transom. "It will run all day on 6-gallons of gas," the technician working on the boat told me. We dashed back in the rain to the main plant, where we headed for the laminate shop, but first a quick stop in the QC Laboratory. The Quality Control laboratory checks all materials and processes used in building Boston Whalers. The lab even has an Instron machine for measuring tensile strength, and subjects many elements of the boat structure to destructive strength testing. They also have an oven for burn testing and strength testing of materials at elevated temperatures. I asked about the details of the laminate schedule, noting that Whaler generally does not disclose this to magazines doing boat reviews, while many builders publish full details about resins and materials used. Ron replied that the Whaler laminate "speaks for itself." "The precise components used are not as important as the combination of them," he explained. "Just because a certain brand of resin is used, it does not guarantee any special results unless the underlying structure and design are appropriate. Whaler uses extensive quality control of all materials that go into the boat. For example, resin deliveries are tested before being accepted and pumped from the truck into the factory tanks. Also at the start of each shift, all chopper guns in use must submit a sample of their output to QC for analysis to verify the proper resin/fiber ratio." On the shop floor, every assembly step or station is equipped with a special light. When a process has been completed, the assembly technician turns on the light to request a QC inspection and approval before the work can be moved to the next station or the next process begun. 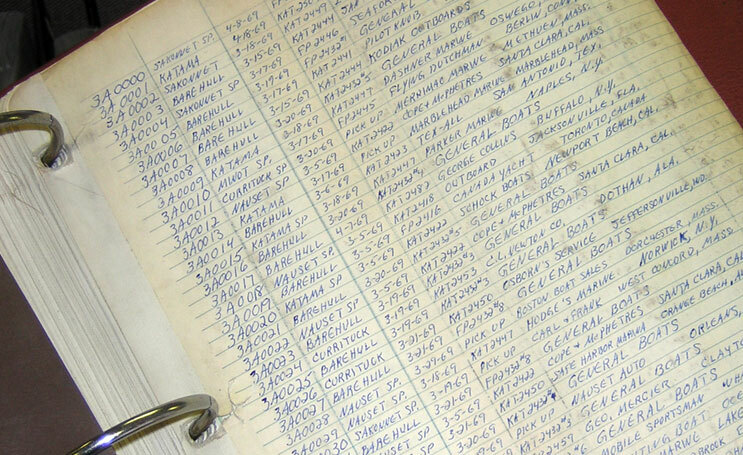 All of this information is recorded on individual records or dossiers for each boat built. This document bundle follows each boat through the manufacturing process, and is ultimately archived for future reference. From QC we went to the pre-fab area. This is the starting point for the usual factory tours. Here all elements needed for the laminate process are pre-fabricated. There is quite an array of materials involved, as a large display informs visitors. Cloth, wood, and phenolic reinforcement materials (also known as WhaleBoard®) are pre-cut to shapes and prepared for the lamination floor. The Lamination department runs two shifts each day, while the assembly department works a single (ten-hour) shift. A large display shows samples of all the various materials used in building a Boston Whaler. Chris is especially interested in that material in the center column, three down from the top. If you think all there is to a boat is the hull mold, what a surprise. There are all kinds of small molded parts being made: hatch covers, deck access covers, consoles, seats, etc. Many, many small parts are in production. There are molds everywhere. Also, because the boats have a ten year hull warranty, many mold are retained for at least ten years after a model is out of production. As you can image, that means a lot of molds to store. The smaller parts are molded in three ways. The conventional open mold technique is used for many parts, like center consoles and large deck cover plates. In these areas there is some inevitable chopper gun residue seen on the floor and fixtures. However, two closed mold techniques are also used. Parts like some deck hatches are hand made in two-piece "cold press" molds. The laminate structural elements such as the wood core and cloth reinforcement are laid into the mold, resin is added, and the two sections of mold are brought together under pressure from air bladders. This creates nice parts with a finished surface on both sides that can be trimmed to final dimensions. The newest technique is similar, but uses a controlled injection of resin. I believe this is called Resin Transfer Molding (RTM). A quite elaborate set up is needed with automation controlled pumps, temperature controlled resins, and hydraulic pressure on the mold. The result is very consistent part output, with weight variances between parts down to just an ounce or two. The process also allows for faster cycle times, and one station can produce a dozen or more components per shift. Another advantage is there is no sprayed resin, so the work area is very clean with no chopper gun residue anywhere. Sea Ray is using this technique to make entire hulls, but it cannot be adopted for Boston Whaler hulls due to the Unibond™ design. Larger parts like hulls and decks are laminated in the traditional open mold technique. Gelcoat is applied to hull and deck components in special rooms to control the environment, to keep the mold clean, and to reduce contamination. Any over spray of resin is evacuated by special air handling. 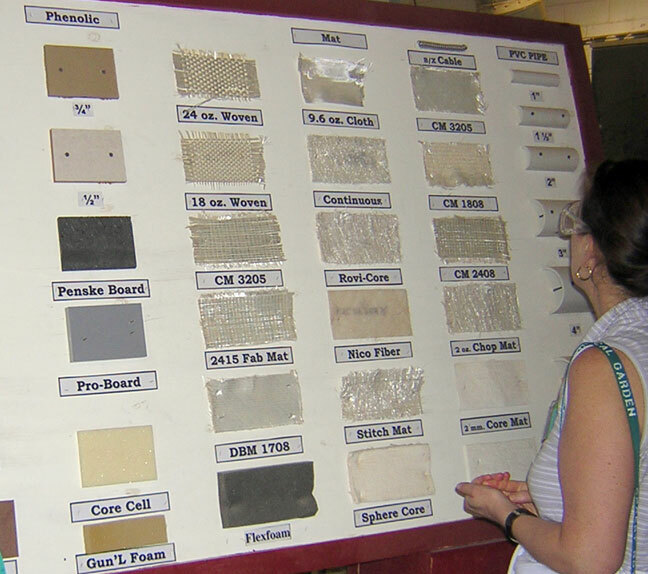 All molding processes require the same general pattern. First the mold must be carefully cleaned and prepared. We were warned not to touch any mold surfaces during our visit, as the oil from a single finger print could create flaws in a part made on that mold. Whaler is very serious about this. At one point I extended my hand and pointed a finger at a mold, and two voices in unison said, "Don't touch that!" After the mold is cleaned, it is waxed to a high gloss and a mold release agent is applied. All molds we saw were female molds, so the structure is built from the outside inward. Thus the first coat applied is the outer gelcoat layer. This is sprayed in by hand, with the contrasting color (green) of the mold providing a visual aid to the operator about how thick the coverage is. Considering that the finished boat may cost over $200,000, I get the impression that the guys spraying the gelcoat know what they are doing. Whaler probably does not let any rookies run the gelcoat operation. After the gelcoat is applied and allowed to cure, additional skin coats of resin and fiber from a chopper gun are sprayed. The laminate is built up to the desired thickness, and at this point reinforcement materials are applied. This involves many different types of material, including cloth, but most notable are plywood, phenolics, and other plastics. Each reinforcement is chosen to provide the best strength and weight for the particular application. Wood still is an excellent material for transoms. With careful design using finite-element analysis the laminate structure can be made as strong as needed yet not become too heavy. We left the small part molding area of the laminate shop and entered the big rooms where hulls and decks are laid up. Unfortunately, we arrived just as the shift was changing so we did not see any construction in progress. There are several large rooms (with one wall open) where prepared molds are wheeled for application of gelcoat and laminates. The hull and liner of the Unibond™ hull are laid up in unison, then combined while still curing. This is done by inverting the liner mold and lowering it onto the hull cavity. There are overhead cranes for this, and, again, the custom made tooling and fixtures are designed to make this process as easy as possible. The two molds are tightly clamped together. The size and strength of the combined molds is impressive; it has to be to withstand the pressure from the interior foam which is about to be injected. The joined molds are then wheeled to the foam room. The foam injection has gone completely high-technology at Whaler. Instead of the old technique--two guys, some buckets, and an electric drill with a mixing tool--foam injection is now done on a very elaborate and sophisticated machine custom built for Boston Whaler by Hennecke Machinery. The operator prepares for foam injection by selecting the program for the specific model of hull. "These are preset by our engineers," Ron tells us. The machine then determines the amount of foam needed based on the boat's recipe. It also checks the ambient temperature, the temperature of the foam A and B components, and the amount of the liquid foam in the tanks (looking ahead so it won't run out in the middle of a "shot."). The flow rate of the foam A and B component and the PSI at the nozzle are also verified. Using a wireless remote control, the operator stands on the mold fixture and positions the nozzle of the foam machine into the foam injection port (sprue hole) on the top the mold. At this point the process stops, and a Quality Control inspector must double check all settings. Once everything is confirmed, a Unibond™ hull is created at the touch of a button. It is a bit anti-climatic. Some pumps start with a modest groan and whir, and in less than a minute the precise amount of two-part liquid foam has been mixed and shot into the closed hull mold. There is no frantic activity, and just a modest call of "fire in the hole" before the foam is actually injected. As soon as the foam operation has finished, the operator immediately retracts the nozzle and inserts a special fitting into the mold plug to close the injection port. Air operated clamps snap shut and hold the plug in place. After a few minutes, evidence of the foam begins to appear, escaping from the closed mold through a series of vents. In sequence from stern to bow, little worms of foam grow out of the vents, giving an indication that the foam has pushed its way into every segment and cavity of the hull. By the way, each model's mold assembly positions the hull at its own special angle, with the bow trimmed up, to help the expanding foam find its way through the mold. Not a lot of foam is wasted, as each vent typically grows only a few inches of excess. Chris stands in front of a 170 MONTAUK which has just been given a "shot" of foam to create its famous Boston Whaler Unibond™ hull. As you can see, the hull and liner are still in their molds, which have been clamped tightly together. Small amounts of freshly expanded foam grow from sprue holes in the molds. Note how the molds are set at an angle, allowing the foam to grow from the stern to the bow. In the background are the molds for a 305 CONQUEST which has also just been injected with foam. You can see the nozzle of the elaborate foam machinery just in the top of the picture. After the foam shot, the new Unibond™ Whaler will sit in the mold for as long as 24-hours, curing into a one-piece structure of outstanding strength and relatively light weight. Next comes mold separation. After the hulls are removed from the mold they will be weighed and the readings recorded. Every hull must fall into a limited range of weight. Hulls with too much weight variance are marked for special review by QC. I think some of those boats cut in half for display or demonstration may be hulls that failed to meet the weight limit tolerance. Ron remarked that they have had some old hulls come back to the factory, and the weight variance from the current hulls is not as much as you might think. In some models, the newer boats are lighter, not heavier, as is often rumored. 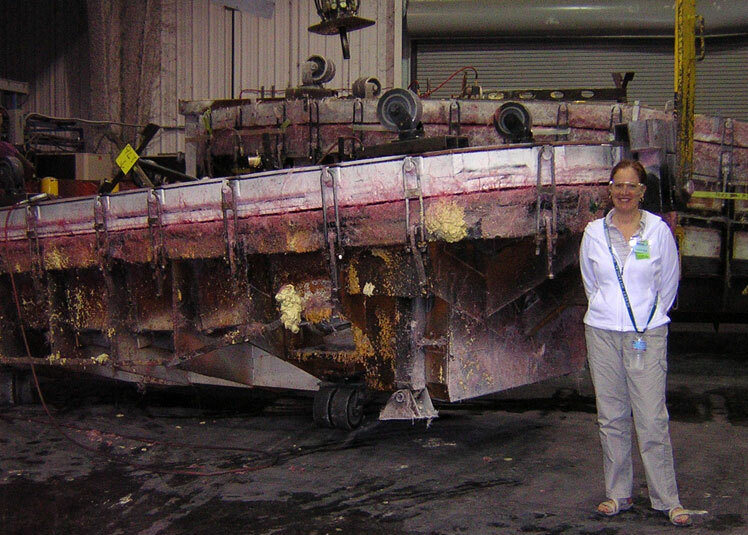 With the boat removed, the molds go back to the laminate shop to be carefully cleaned and prepared for the next boat. For boats that are in high production, like the 170 MONTAUK, more than one set of molds has to be made, otherwise it would be difficult to construct more than one boat per day. The popular 170 MONTAUK is built at the rate of four boats per day, so there must be at least two sets of molds available. Next the hull is placed onto a production fixture so it can be easily wheeled around the plant. Whaler builds all of these fixtures at the plant, always with an eye to making access to the boat during assembly as easy as possible for the workers. Small boats in the LEGEND series which are sold with a trailer as standard equipment get set on their trailer for their trip through the rest of the plant. The next stop is the trim shop area. This is probably one of the hardest jobs on the plant floor. The workers wear a great deal of protective clothing, almost like space suits, as they use air-driven cutting tools to remove all the flashing from the hull-deck joint of the boat. This generates quite a bit of scrap and fiberglass saw dust. Cutting off the mold flashing has to be done very carefully, as a bad cut could easily ruin a very expensive hull. After the excess is cut away and the joint lines trimmed, the hull is ready for the assembly area. After the hull has been laminated, foamed, cured, and trimmed, it heads for one of eight assembly lines. Boats which are sold in packages with trailers are already loaded on their trailer, which will serve as the production fixture as the boat passes through the plant's assembly line. Larger hulls ride on special supports which allow the boat to rolled along. Like an automotive plant, the assembly area has production lines. Each line is specialized for assembly of particular models. There are eight lines. The inner lines assemble higher production boats like the 170 MONTAUK or 130 SPORT, while the outer lines build larger boats that will require more complex assembly and remain on the line for much longer. The structure of smaller boats will be mostly formed by the two pieces of the Unibond™ hull, the deck and the hull. Some hatches, deck cavity covers, and a console will be added, but the principal boat itself is built with just two major assemblies. Larger boats use a third major component, the cabin or deck cap. 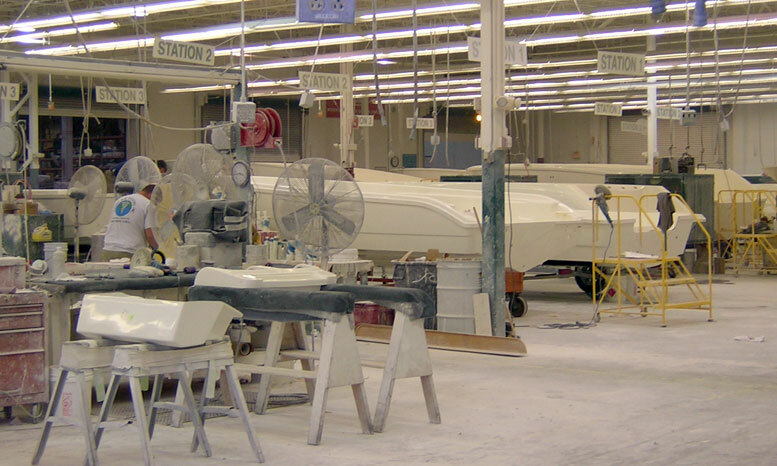 These are molded and assembled separately, and arrive at the assembly line to be added to the Unibond™ hull. A three-part major assembly is a long standing element of the Boston Whaler boat. In the past it was used on models like the REVENGE, where the cabin and console superstructure was molded separately and joined to the Unibond™ hull after molding. This same approach is used in many models, especially the CONQUEST series of cabin boats, as well as some OUTRAGE models. It is quite interesting to see hulls without the tops on them, and conversely to see tops without hulls underneath them. By postponing the joining of these two components, however, Whaler gains quite an advantage in the assembly operation. As much as possible, Whaler tries to build the boat before it gets assembled into the final structure. Using this sub-assembly approach has many advantages. For example, all the wiring and plumbing can be built into the hull before the top superstructure is lowered into place. Running wires through open troughs is much easier than snaking them through closed tunnels. And similarly, the top superstructure can be pre-wired and assembled while it is separate, permitting easy access to both side of the structure, above and below. This greatly eases attachment of accessories like navigation lamps, controls, electrical panels, etc. A great number of special fixtures and tooling are used to position sub-assemblies outside of the boat at a convenient orientation so the assembly technicians can easily access them. If a technician has to work on the underside of an assembly, the fixture holds the work at an elevated height so the person working from below does not have to crouch. This kind of ergonomic design was seen in many places in the plant. It leads to a better work environment and that leads to better quality work output. For example, we saw center consoles elevated on fixtures so that a technician could work on them from underneath while standing erect. This makes a much better position to work from than crouched down in the boat and bending inward from the side opening. The Unibond™ portion of the hull of a 235 CONQUEST is seen without its superstructure cap. This view is looking over the transom. In the foreground are the two large "knees" molded into the hull which distribute the load of the engine's thrust to the rest of the hull from the transom. At this point in the construction, all workers coming on the boat must wear special boots and pads to prevent the hull finish from being marred as they work. Doing as much work as possible off the boat also reduces the chance of damaging the hull or deck finish. When a boat reaches the point that workers much come aboard to complete their jobs, they all must wear protective clothing to keep the hull and deck finish from being marred. Whaler also fabricates many of their own electrical wiring harnesses. Doing this work in the plant results in better control and allows changes to be implemented quickly. For example, if a harness is discovered to be slightly too long or too short, the design can be quickly changed in the wiring harness pre-assembly station. Every part that is used in building a Boston Whaler is listed on a Bill Of Materials (BOM). Assembly technicians cannot get parts unless they are on the BOM. This insures that the proper part is always used, and there is much higher consistency in production. If the BOM calls for a certain type of fastener, these have to be obtained from the parts department as specified by the BOM. The assembly technician cannot just grab a fastener from a bin, perhaps using the wrong one in a particular spot. 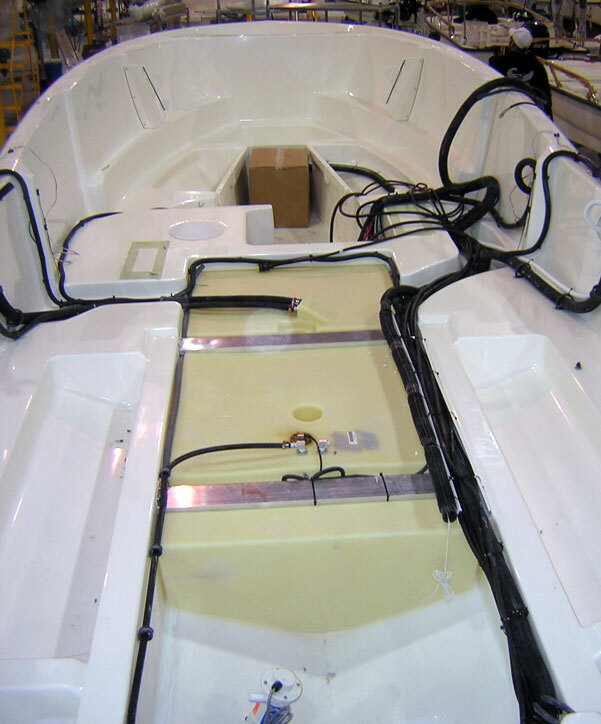 Working with a partially assembled hull allows easy installation of components. A molded plastic fuel tank has been installed, and strong aluminum bar stock added above it. Pre-assembled wiring harnesses are laid into place, awaiting final connection to other components to be added in a following step on the assembly line. Once the superstructure and deck cap are added, most of this will be covered and out of sight. This boat is a 235 CONQUEST model. As the boat nears completion, the top structure is finally joined to the Unibond™ hull. This joint is secured with a strong adhesive. The application of the rub rail is done at this time, and this adds mechanical fastening. At this point the boat is ready for the Mercury motors to be hung on the transom. On smaller boats, once the motor is installed it is started and run briefly from a separate fuel supply. A small tank is used to immerse the lower unit during the testing. On larger boats, the boat may be hauled to the water and tested. In addition to the engines these larger boats have many pumps and plumbing systems to be checked, and they need to be in the water for everything to work correctly. I noted an interesting operation at this point in assembly. The engines are wheeled in from storage to assembly with no wiring attached. This is not how you would typically find a motor delivered to you as a loose motor from a dealer; there it would probably have its battery cables pre-rigged. But the motors at the factory are just motors, nothing attached. Here's why I am telling your this. Some time ago I went to a boat dealer and inspected several Mercury motors. On all of these motors I saw, the connection where the battery cables attached to the engine had been sealed with liquid electrical tape. That is a good idea, but I was appalled at how sloppy the sealant had been applied. It was splashed all over adjoining components. My reaction to this was not favorable. To me it was indicative of sloppy workmanship, and I (mistakenly) had blamed Mercury for this. I was surprised to see that at Whaler, once the motor was on the transom the battery cables were attached by an assembly technician, who then proceeded (quite carefully) to coat them with liquid electrical tape. I suddenly realized that on those sloppy installations I had seen at the other brand boat dealer, it was not Mercury who was to blame, but rather the boat builder who installed the engines. At Boston Whaler there is a Mercury factory outboard specialist on hand who trains the Boston Whaler assembly technicians. He also helps to resolve any problems that might come up with motor installations, and he maintains close coordination with the Mercury factory. Boats leaving the assembly line are given a careful going over for any flaws. I noticed a black grease pencil circle around a spot on the hull of a boat just at the last station on the line, and I moved in for a closer look. I stared at the area, looking for a flaw, but none was readily apparent. Finally, I asked Ron what was the problem being encircled. He took a glance and saw it right away. "There is too much sealant on that fitting; they'll have to trim it back a little." I have heard a lot of stories at boat shows, from salesman of dealerships who no longer carry Boston Whaler boats, in which they recount problems with declining quality--one guy even told me their dealership had to re-do gelcoats on Whaler it "got so bad"-- but after this demonstration, I really have little inclination to believe these sour grape stories anymore. After the boat is finished with final assembly and testing, it goes outdoors under a large overhanging roof to the detail department. The detail professionals carefully wash, clean, buff, polish, and wax these new Boston Whalers, then wrap them up for shipment. Due to the heavy rain that day, we didn't get too far into this process, but we could see several days of inventory sitting on racks awaiting trucks for delivery to dealers. A great help to all Boston Whaler owners, Chuck Bennett of the Customer Service Department smiles for this picture at the end of the assembly line. Towering over Chuck is a new 305 CONQUEST headed for final detailing and wrapping for shipment. They've just added the familiar cove stripe and WHALER logo to the hull sides. With the tour of the plant floor completed, we said a farewell to Ron, who had to get back to the Design Department for a meeting. We then returned to the main reception area and the Customer Service Department where Chuck works. "We've got to see these famous records from the old boats," I told Chuck. "The individual boat dossiers are all locked up in a big room," said Chuck, "but I can show you these hull number books we use all the time." 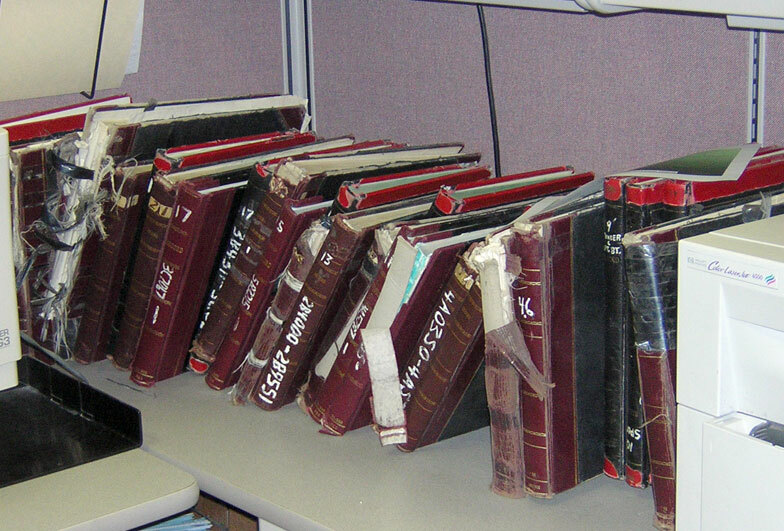 Chuck directed us to a shelf of well worn older journals containing records going back 30 years or more. These are the books that Chuck and other Customer Representatives use to look up hull stencil numbers and find "born on" dates for old boats. Over in Chuck's work area in the office are these old records of boats going back to 1959. Indexed by the hull's stencil number, they show the date of construction and the dealer to whom the boat was delivered. Here is a peek at the records for 16-foot hulls. For example (near bottom of page), hull 3A0028 was finished off on 3-21-69 (36-years ago) as a NAUSET SP and picked up at the factory by Boston Boat Sales of Dorchester, Mass. I wonder where that boat is today? Our visit to the Boston Whaler factory was complete. It was a much anticipated and very exciting afternoon, and it was really a let-down to have to leave. It was especially kind of Ron and Chuck to give us this special look at the factory, and we appreciated it very much. As we were leaving, I suddenly realized that I had been so wrapped up in the tour itself that I didn't take enough photographs. Fortunately, Mike Brantley was there a couple of years ago, and he took many more pictures than I. For a better visual look at the factory, please visit Mike's fine website and enjoy his excellent photographic tour of the Boston Whaler plant, too. DISCLAIMER: This information is believed to be accurate but there is no guarantee. We do our best. This article first appeared May 3, 2005. Copyright © 2005 by James W. Hebert. Unauthorized reproduction prohibited. For permission to reproduce all or portions of this article, please contact the author.